Getting out and taking photos has been rare for me lately, as has going to see anything worth taking photos of. However, a couple days ago Maggie said she wanted to go to a massive wedding dress district up by Tiger Hill here in Suzhou. Tiger Hill is a rather large temple complex that is the burial place of King He Lu (d. 496 BC). 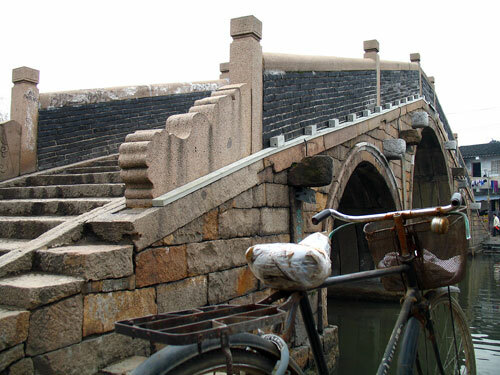 At 2,500 years old is one of the oldest landmarks in Suzhou and likely makes for some great sightseeing. Sadly, wedding matters forced us to save exploring the hill for another day, but instead we walked back to the main part of the city via Shan Tang Street. Though not as old as Tiger Hill, Shan Tang Street is an amazing little time capsule of days gone by. 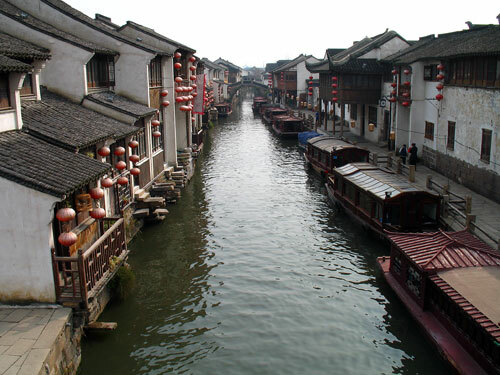 The narrow little cobblestone lane runs for about 2.5 kilometers nestled between one of Suzhou’s many canals and a collection of antique(d) homes. 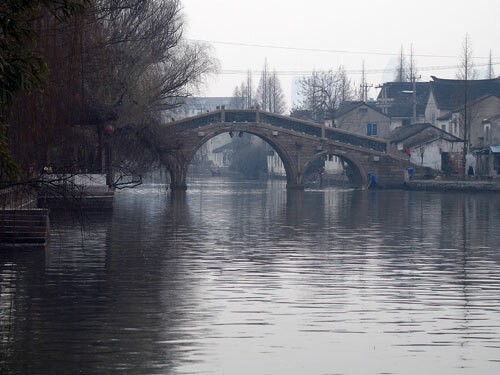 Maggie summed it up when she exclaimed that this is what she ‘thought’ Suzhou would look like when I first mentioned moving here. It seems even the Chinese buy into the naive traveller/like the postcards syndrome I’ve so often given China newbies a hard time about. 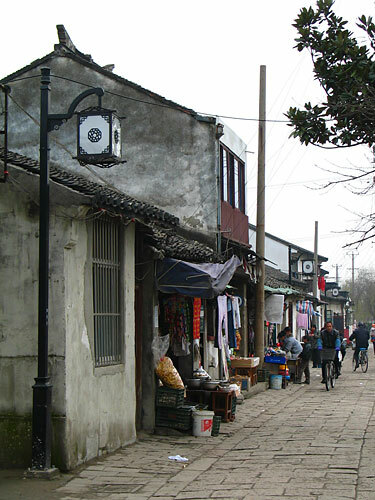 The street is one of those strange mixes of barely-functional/semi-squaller living and state-fed heritage site similar to many of the “river towns” that dot Jiangsu and Zhejiang provinces. Having been washed in the murky, oily waters of the canal, the residents hang their clothes from trees or loosely hung lines criss-crossing the lane’s many offshoots. Most homes don’t contain a private washroom, but the residents instead use a bucket or the frequent (and new looking) public washrooms. The northern half of the street was quite a pleasant walk, but as you near the bottom end you start to get bogged down by touristy trinket shops selling Mao paraphernalia, rain-aged coins and fake jade. You also start to run into the crowds that have spilled into the street from the perpetually busy Shi Lu shopping area. It was at this part of Shan Tang Street that we accidentally ran a racist roadblock money grab and caught hell from the ticket lady because of it. Apparently, in a particular section of the street (and with the properly coloured skin) you need to pay to walk down the road. This bothered me (and uncharacteristically, Maggie) a great deal, not because there was a fee involved but because we were the ONLY ones asked to pay it. While the woman explained the need of a ticket to us two dozen people walked by unchecked. Maggie inquired why they didn’t need a ticket and the woman (without a glance) dismissed them as people who lived on the road. I’m not sure what this section contained, nor do I know if it was worth whatever they were asking for the tickets – we said to hell with it and just went for some Sichuan food. After about two kilometres of pleasant travel on the road, we’d seen all we felt we needed to and didn’t have to pay a kuai for it. 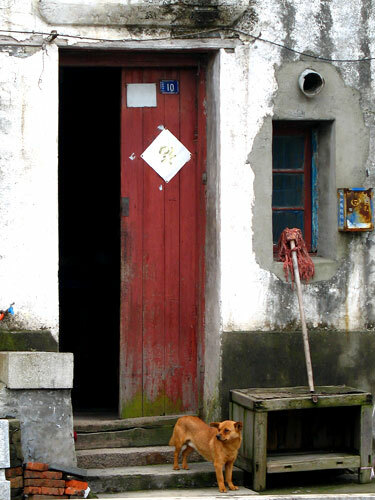 See all China Expat Life, Farrago, Suzhou, World Travel posts. Wow i’m surprised about that racist roadblock, because i have walked down that street many times and nobody has ever tried to stop me and get me to pay. next time just keep on walking when she starts talking to you its not like she can really do anything to stop you walking down a street unless she has a portable gate that she continually moves infront of you. me and sammi often pretend neither of us understands chinese when someone tells us we can’t go somewhere and eventually they will give up because its not worth the effort. never seen that roadblock before. obviously, it’s BS, and should be ignored. was it on the ‘touristy’ part of the street, or the ‘real’ part? either way, they have no right to demand a fee. Your fake tolls are lame. @Kevin & Steven: It may have been new. The ticket “booth” looks like it was recently put up and it said something about “Shan Tang Street Renovation Project” or something along those lines. Who knows. It was in the “touristy” section of the road just south of 广济路/Guang Ji Lu, and not the “real” part of ShanTang that runs north to Tiger Hill. We tried to ignore them, but the woman ran after us and was pretty insistent. @Stuart: Haha. Man, I haven’t written a Haiku since high school. Yes! you finally made it down Shan Tang jie! Road block? wow, never heard of that one before. by chance i stumbled across a tactic that worked in similar situations: taking out my cell phone and dialing – or appearing to dial someone for help. Or looking at a list of several names and phone numbers of chinese friends. the pedi-cab driver who tripled his fare when we arrived at Guan Qian backed off. The receptionist at a hotel in beijing who couldn’t refund a visa suddenly found out how to give me a credit. @Hek: Yeah, sorry I never did the early morning photo hunt with ya – we’ll do it upon your return (when weather is warmer). @Cadboro: That’s excellent advice had a been traveling alone – but travelling (as I often do) with my wife, who is Chinese, makes it tougher to pull off the “ting bu dong”.